Outdoor party venues los angeles is a popular search term for those seeking outdoor venue ideas for their weddings and events. Are you on the hunt for outdoor party venues Los Angeles? Perhaps an outdoor venue which provides scenery and sophistication while also giving the ultimate guest experience with everything California has to offer? Before narrowing down your choices, there are factors to keep in mind when seeking an outdoor event space Los Angeles. There are an abundance of outdoor party venues in Los Angeles as the area boasts beautiful outdoor event space options. If you are looking to plan an outdoor event initially, what if you decide you want to host the event indoors or the weather requires you to hold the event inside? Is there an indoor event space option and will it meet the needs for your event vision and guest count? There are countless Los Angeles party venues in the area. For this reason when making your outdoor party venues list, consider the location as it relates to your guest list. Where will most of your guests be coming from? Will you need to provide transportation or will the venue be centrally located for your guest list? Remember to consider other travel needs such as travel time, transportation, accommodations, and travel-related expenses for your guests. Are you looking for a conservative vibe? More traditional? A modern chic event? What are your event goals and what looking to accomplish? What message or guest experience are you looking to provide? Taking all factors into account along with what your overall vision is for your event will help you to select between the types and styles of outdoor party venues Los Angeles available. Keep in mind, if there is a Los Angeles area hotel or venue that you like, contact them to see if they have an outdoor venue option for your event. Consider the Intercontinental Los Angeles Downtown if you are looking for a hotel venue. Learn more in this article. For the wedding couples seeking an intimate and relaxing outdoor party venues Los Angeles wedding experience, the beach will always come to mind! Los Angeles boasts a tremendous variety of beach locations and beach houses to choose from that are guaranteed to provide the perfect backdrop for your event. Utilize the beach scenery and views as part of your decor scheme to create the ultimate beach event vibe. For beachy inspiration, a wonderful outdoor event space Los Angeles is Shutters On The Beach, which boasts absolutely stunning views overlooking of the Pacific Ocean in Santa Monica. Duke’s in Malibu provides a spectacular setting on the beach in Malibu which has venue space for a wide variety of events such as birthday parties, rehearsal dinners, Bar/Bat Mitzvah’s, corporate events, bridal showers, anniversary celebrations, lunches, cocktail parties, and more. 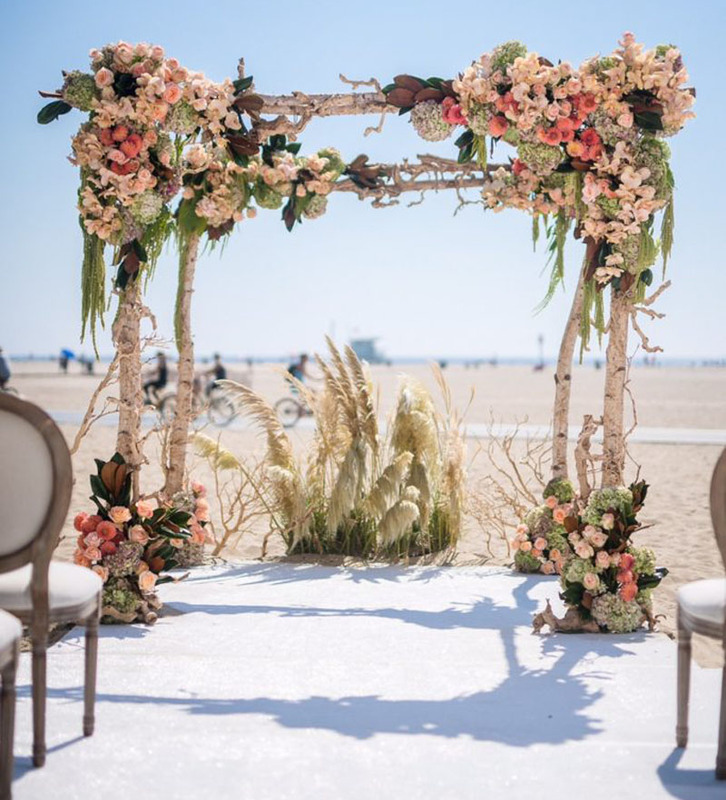 If you are looking to hold a wedding ceremony or affair directly on the beach, this article may also be helpful when planning an event on a beach in California. A vineyard venue is always a beautiful event space consideration. With an open-air setting, a vineyard venue can be the perfect setting for weddings and events. With scenic views and stunning weather, you and your guests will enjoy a spectacular day or evening within California’s most amazing wineries and historical vineyards. If you are open to heading north of Los Angeles, Chalk Hill Estates is a magnificent vineyard. There is also Cline Cellars in Sonoma with rustic charm of landscaped gardens, willows, spring-fed ponds, and breathtaking vineyard views. There are plenty of options when seeking outdoor party venues Los Angeles that elude natural elegance. Each event space offers its own unique features and scenery, so you will want to carefully consider your needs in comparison to what the venue offers. Outdoor party venues Los Angeles is a popular trend as California delivers an unforgettable experience for all types of events. Remember to take into consideration which venue style and area you like most. If the beach setting isn’t your favorite but the idea of a rustic ranch or vineyard affair is appealing, seek out the venues in the area that can meet your needs and go from there. Ensure that you have your budget and guest list established from to make the selection of the outdoor party venues Los Angeles process as smooth as possible. And, once you have selected your venue, you can begin to work on the event floorplan within AllSeated! Most venues can already be found within the platform but if you can’t locate the outdoor party venues name in the search, it’s really easy to upload the floorplan. Learn more about AllSeated’s planning tools in this article.